When the examination season looms, kids can go off the rails in all kinds of ways, but the traditional diet of fizzy drinks, chocolate bars and pizza may not deliver the best support to your child’s revision and preparation. The food pyramid can help you adjust the eating plan for a revising young person, so that they get all the nutrients they need, as well as enjoying their food and not developing anxiety eating, which can lead to other problems like bulimia or substantial weight gain. 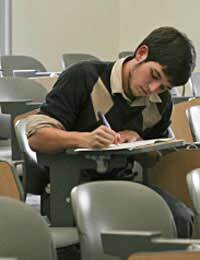 The brain consumes over 12% of the body’s energy – thinking, planning and revising are high brain activities and use up energy at a phenomenal rate – to allow your teenager to have the best chance of success, increase their usual calorie intake by around 10% to allow for all the extra brain-work, and anxiety, that they will be going through. A great way of doing this is to offer an extra snack meal every day. Good options are Greek yoghurt with a bowl of berries to dip in it, a thick smoothie made of whole milk, banana and some crème fraiche, or for those with savoury tastes, a torn up tortilla with a dip of hummus or salsa. Teenagers will be rebellious even when they are stressed, so you’ll often find that they refuse to eat with the family and then turn up in the kitchen at two in the morning making toast and setting off the fire alarm! You can use the food pyramid to devise healthy brain-food for your examination candidate which they will also love to snack on. A wholemeal wrap with some lettuce leaves, peanut butter (use the organic version with no added sugar) grated cheddar and a couple of slices of red onion will give a fantastic mixture of complex carbohydrates, proteins and veggies. Make it up and wrap it in cling film in the fridge. Alternatively a toasted sandwich with mozzarella and tuna can be made in advance and stored in the fridge to be reheated in the microwave – consumed with a side-salad of sliced tomatoes and olives, it’s a complete meal for a stressed teenager. Low iron levels can cause concentration to ebb. The higher the diet is in iron, the more likely it is that children will perform better, especially in tests that are timed as anaemia in particular causes us to think more slowly. This is especially true for teenage girls who tend to have low iron levels anyway. Dark chocolate and beans are two brilliant iron rich foods, and even if your kids say they won’t eat them, you can find ways of sneaking them into their diet. Chilli is a great iron boosting food because it contains beef, kidney beans and tomatoes, a magic blend that fixes iron in the body. Girls often refuse chocolate because it will make them fat, but if you make a hot chocolate drink and melt some really good 70% cocoa or above chocolate into it, they will tend to drink it down without thinking. Of course chocolate should only be an occasional treat, but once or twice a week a few squares will do no harm and can even improve the mood of stressed and miserable revisers. Children who eat breakfast on the day of an exam tend to have marks between 4 – 8% higher than those who don’t. Even if its just a banana and slice of toast, try to ensure your examination candidate eats something before they leave the house.